The Middle East in the World offers students a fresh, comprehensive, multidisciplinary entry point to the broader Middle East. 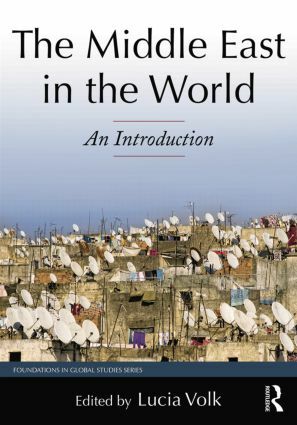 After a brief introduction to the study of the region, the early chapters of the book survey the essentials of Middle Eastern history; important historical narratives; and the region's languages, religions, and global connections. Students are guided through the material with relevant maps, resource boxes, and text boxes that support and guide further independent exploration of the topics at hand. The second half of the book presents interdisciplinary case studies, each of which focuses on a specific country or sub-region and a salient issue, offering a taste of the cultural distinctiveness of the particular country while also drawing attention to global linkages. Readers will come away from this book with an understanding of the larger historical, political, and cultural frameworks that shaped the Middle East as we know it today, and of current issues that have relevance in the Middle East and beyond. Lucia Volk (PhD in Middle Eastern Studies, Harvard University) is Professor in the Department of International Relations and co-director of the Middle East and Islamic Studies program at San Francisco State University. She is the author of Memorials and Martyrs in Modern Lebanon and numerous articles in leading journals.